I work and couldn’t get this posted each week, I’m sorry about it, everyone. Alright, that said… let us talk about Shadowhunters so far. I love Harry Shum Jr, but it is Matthew Daddario who is having everyone watching the show, he is so damn gorgeous, and he does a great Alec, I truly can’t wait until THE episode comes out, all the fans of the book know what I’m talking about. 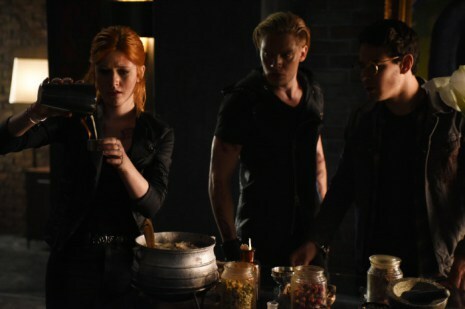 I have no complaints about Izzy, since Emeraude is awesome, I didn’t like Maryse Lightwood a lot, I think it is a little too much, and Max, I think is too little, I guess we are talking about the last episode Of Men and Angels, but yes, I thought things were really taking a completely different tone there, but at least Alexander was being all cute and flustered with Magnus, I love that! As for Clary, whoa! She is the main character, and well, I don’t know, she’s Clary in the books; I find her a bit annoying at times but she is one of the female leads that I tolerate, who I don’t like? Bella (Twilight), Anastasia (FSOG) same character, different ages, I know, and I yet to find someone more annoying than her, if you do, please do tell me. But so far, all episodes of Shadowhunters really leave me wishing for more, and they make me want to read the books again, which I did, I’m reading City of Bones, and it is as good as the first time, I think better, since the first time around it cost me a bit to finish book 1 but after that, I read the rest like there was no tomorrow, and I can guarantee that you’ll want to read the books by watching the show.